Posted on April 15, 2013 by Sarah S.
Recently, I found myself with some extra coconut from a new granola bar recipe I was trying, so I decided to give a coconut cookie recipe a try. The cookies were excellent: chewy, light, and just sweet enough. Preheat the oven to 350 degrees F. Mix flour, baking soda, and salt. In a separate larger bowl, cream the butter, brown sugar, and white sugar until its smooth. Add the egg and the vanilla until mixture is fluffy. Bit by bit, blend in the flour mixture. Add the coconut. Drop 1 inch round balls of the dough onto a ungreased cookie sheet. Gently press each ball slightly flat. Space cookies 3 inches apart. Bake for 8 to 10 minutes or until they get slightly golden on the edges. Let cool. 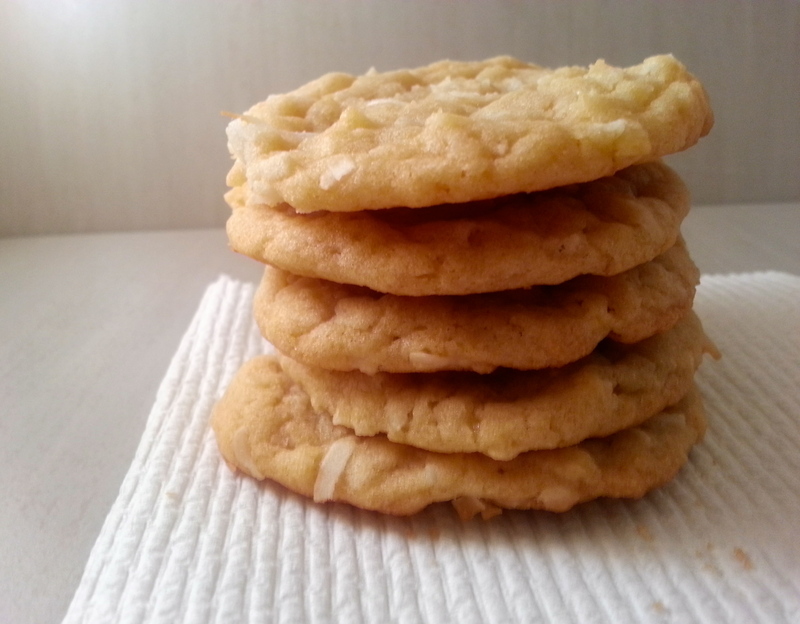 This entry was posted in Food and tagged chew coconut cookie, chewy coconut cookie recipe, coconut, coconut cookie, cookie, cookie recipe. Bookmark the permalink.